Is there any way to use contMap with missing data? Any help would be greatly appreciated. Thank you for your time." They are totally on the right track, but things get a little trickier than they might have anticipated because whereas fastAnc (when used in it's default mode) just returns a vector of estimated character values at nodes, anc.ML (when some taxa are present in the tree but missing from the input data) returns a list with the vector missing.x containing the MLE phenotypic trait values of taxa with missing data. It also happens to be the case that I never got around to adding this updated version of anc.ML to the phytools package. Well, I have now made both updates so it is possible to (1) specify an inference method (method="fastAnc" or method="anc.ML"); and (2) phytools function anc.ML now permits missing data, in which case the states for the tip taxa in the tree missing from the data vector will be estimated using ML. The code for these updates are here: anc.ML, contMap, but since both use internal functions not in the phytools namespace it is probably wise to download the latest phytools build and install from source. "H" "I" "O" "T" "W" "Z"
Do you think it might be worthwhile to annotate the tips with missing data so which are missing is immediately apparent? Maybe give them a white bubble or something at the very tip? This can be done easily already by the user because contMap works with ape tiplabels and nodelabels. Good suggestion. Would it be possible in contMap to specify our own colorramp instead of stuck with the default red-to-blue? 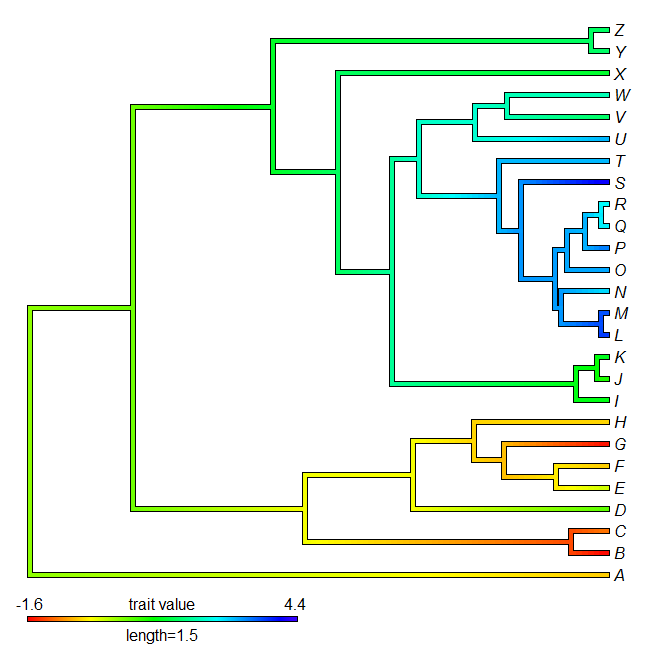 length of phenotypic and of phylogenetic data do not match. In mean.default(x) : argument is not numeric or logical: returning NA. Also when I use the setdiff function, the missing value taxa are not shown correctly, i.e the ones which have missing values arent shown, instead its random all the time. (1) Continuous character data should be formatted as row #1 as species names, and row #2 as continuous character data. I think you might need to transpose your data matrix. (2) If you read in your data file as read.csv, it's read in as a data frame and that throws an error "Error in A[i, 1]/YY[j] : non-numeric argument to binary operator" So I used the unlist() function to convert it into a vector... which seemed to make the function happy! Hopefully that helps and isn't secretly misleading! (Please correct me if I'm wrong!) Thanks Dr. Revell for writing such an awesome function! I did try the code you've posted after transposing my data, but I am still getting the same error .